Finally it’s there: iCaching 4.0 with API support! Through the API you can also query the Geocaching.com database directly. Define your criteria and download those caches. Just before going out in the field you can refresh the cache-availability from the cachelist, so you won’t be searching for archived caches. On every start of iCaching it will check your last logs to keep track of your found caches. This is the first step in supporting the API. More functions will be added over time. http://icaching.eu/wp-content/uploads/LogoWebSite200x100.jpg 0 0 mariusdereus http://icaching.eu/wp-content/uploads/LogoWebSite200x100.jpg mariusdereus2013-06-29 13:40:272013-06-29 15:18:14iCaching version 4.0 released! In the meantime we’ll demo another new feature: the Import API function. From this new dialog you can query for geocaches straight from Groundspeak.com. You may refine your search with several filters on cache-properties. Today two years ago iCaching was launched in the Mac App Store. After a half year of programming we dared to release the first version. This version had only GPX-import and -export. The Map inside the app was a static Google Map without zooming, panning etc. But there was a lot of enthusiasm about the birth of a real Mac geocache manager. A few point-updates brought some minor new features and fixes. 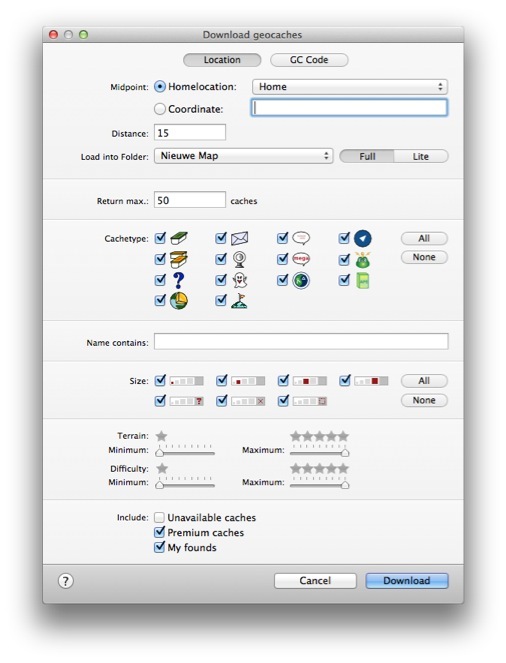 Version 2.0 released in November 2011 added gpsBabel for direct support of many GPS-devices and file formats. The interface was tweaked for smaller screens. Version 2.5 followed in September 2011 with a completely revamped Maps. The map became interactive: zooming, panning, selecting caches became possible. 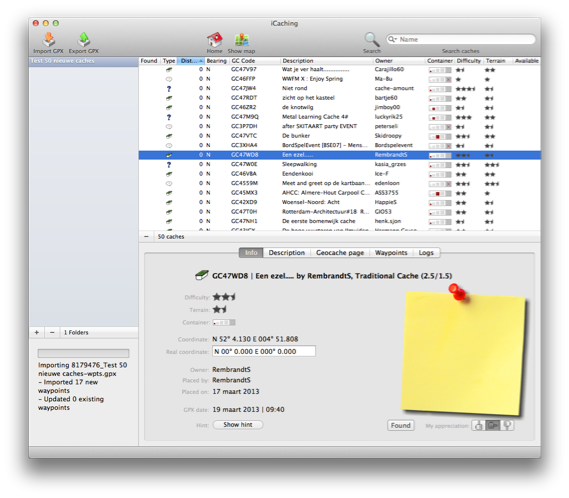 Version 3.0 in February 2012 brought the new Library pane with Folders and Smart Folders. Searching was extended to the whole library. The period between version 3.3 in April to version 3.5 in December 2012 was a pause in the (almost) monthly release-cycle. We were wrestling with the new Sandbox requirements from Apple and some other issues. 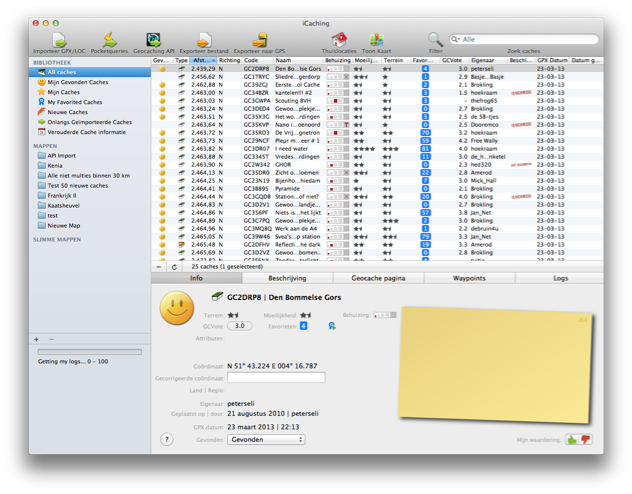 But in December version 3.5 was released with some welcome improvements on speed and the export-dialog. In the main time we started development on API-support. Tonight we unveil another aspect of the API-implementation in the next iCaching: the pocket query dialog got a complete make-over. 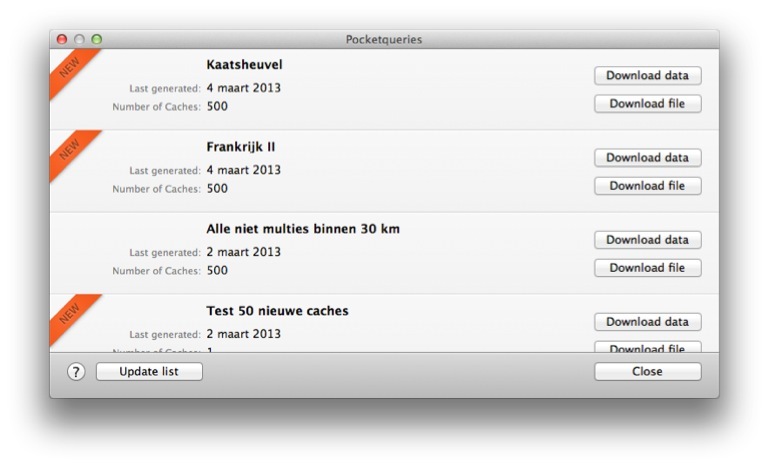 In the old version, you got a web view with the pocket query page of the geocaching website. The new version lists all available pocket queries in a clear list. Queries that are new, or generated after the last download, are marked with a ‘new’ badge. Each pocket query can be downloaded as ‘traditional’ zipped GPX-file by clicking the ‘Download File’ button. This is blazing fast, but doesn’t give you the new cache properties like favorite points etc. The other method is ‘Download data’. 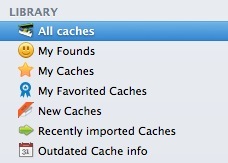 Then all cache-data is downloaded through the API with all new properties included. The downside is that it’s (much) slower, therefore we offer both options. After a very long time of developing, version 4.0 with geocaching Live API support is on the horizon. Last weekend we send the first beta version to Groundspeak for approval of our API implementation. This week we will unveil some of the new features. Warning: It may take a while before this version is production ready. The last debug work, translations and help file creation will take some time. But the update will be free, so you have something to look forward to…. 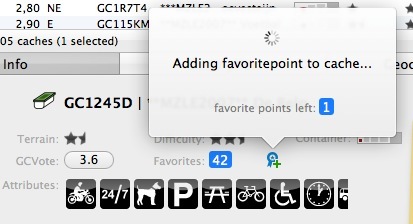 Maybe one of the most asked features is support for favorite points. While geocaching.com doesn’t include them in pocket query files, there is no way to import these favorite points without using the API. So for version 4.0 they’re in! Well, that’s it for today. Keep an eye on the site for more…. We integrated GCVote, a third-party rating system for geocaches. 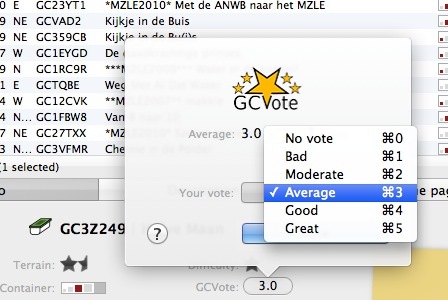 Every time you import geocaches, iCaching checks the GCVote-rating. You can also sort and filter on this rating. Moreover it’s also possible to vote for the cache quality yourself. Insert your geocaching-name in the iCaching preferences, obtain a password from GCVote.com (see instructions on their site www.gcvote.com) and start voting (Lion or higher required). We redesigned the Waypoints-tab with a more clear layout. And on the Logs-tab we added some new filters; easily filter your own logs (insert your geocaching username in iCaching preferences first) and/or filter for text in the logs.